An egg is probably the world’s most versatile ingredient. And, thinking of all the things you can do with whole eggs, yolks, whites, quail eggs, and duck eggs, I think an egg might also be the world’s most delightful ingredient. Lara Ferroni’s latest book, Put an Egg on It , supports those claims and offers delicious uses of eggs of all sizes. I recently received a review copy. She writes that her fascination with topping all sorts of dishes with an egg started when she encountered New Mexico-style stacked enchiladas topped with a fried egg. But, you’ll find more than just fried eggs as the crowning touch in this book. First, there are cooking instructions for the basics including soft-, medium-, and hard-boiled; sunny-side up and over easy or hard; scrambling; poaching; pickling; and meringue. Of course, there are great suggestions for adding a sunny-side up to things like Salsa Roja Chilaquiles, Kimchi Fried Rice, and the Egg-Topped Deep-Dish Pizza. And, then there are things like Blasted Cauliflower with chopped hard-boiled eggs, Roasted Eggplant Puree with Harissa and grated hard-boiled egg, and Creamy Green Goddess Wedge salad with shredded hard-boiled eggs. All of the recipes are fun and very approachable whether for breakfast, brunch, lunch, dinner, dessert, or cocktails. Speaking of fun, the meringue “eggs” are faux fried eggs made with a dollop of orange curd, and the Maple Meringue filled Doughnut Holes have been calling my name since I first flipped through the book. Also right away, I was drawn to the breakfast bowls each topped with an egg because they look a lot like what I usually prepare for weekend brunches. A few pages later, I came upon the Brussels Sprout Hash. I don’t know why I’d never thought to make a hash of Brussels sprouts before. I’ve made hash with just about every other vegetable which left me feeling silly for overlooking Brussels sprouts. They’re so pretty when they’re thinly sliced, I couldn’t wait to get chopping. This makes for a low-maintenance brunch dish since everything is cooked in one skillet. First, a sprig of rosemary was fried in olive oil. Our rosemary plants have been taking over our yard thanks to the recent rain, so I love getting to snip off sprigs every chance I get. The rosemary fries for just a minute and is then set aside to cool. Minced onion and garlic were added to the pan next and cooked until softened. The fried rosemary leaves were pulled from the stem, chopped, and added to the skillet. Next, shredded Brussels sprouts were added to the cooked onion and garlic and sauteed until tender and starting to take on some color on the edges. Then, it was time for the eggs. 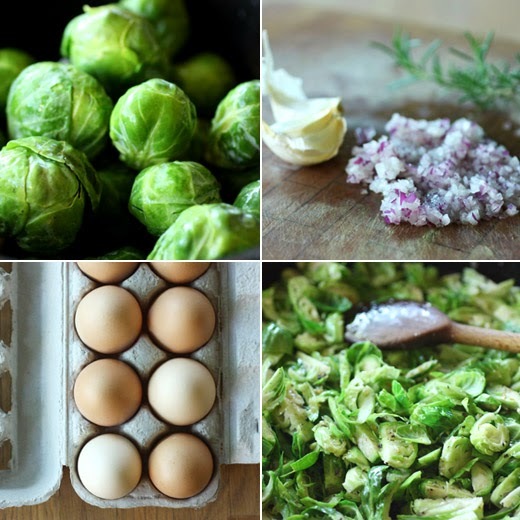 Little wells were scooped into the Brussels sprouts, and an egg was cracked into each. The skillet was covered, and the eggs were left to cook for a few minutes. Brussels Sprout Hash will now take a spot in my rotation of brunch options, but it would also make for a quick and easy dinner meal. With so many different ideas for incorporating eggs into dishes, I’ll be grabbing this book for inspiration for meals at any time of day. Or instead of planning a meal, a cocktail like the Lime Meringue Margarita might be the next recipe I have to try. Recipe reprinted with publisher's permission from Put an Egg on It . If brussels sprouts had been served this way when I was a kid, instead of being little balls of gray, bitter mush, I might not have missed out on twenty-something years of one of my favorite fall vegetables. How sad! Heat the oil in a medium, lidded cast-iron skillet over medium heat. When it’s shimmering, add the rosemary. Cook for about 1 minute, then remove the sprig, setting it aside on a plate to cool. Add the onion and garlic and reduce the heat to medium-low. Cook until the onion softens, about 5 minutes. Add the sprouts and increase the heat to medium-high. Chop up a bit of the fried rosemary leaves (discarding the woody stem) and add them to the pan. Stirring frequently, cook until the sprouts are golden on the edges, about 5 minutes. Use a large spoon to create 4 wells in the sprouts and carefully pour an egg into each. Reduce the heat to medium-low, cover, and cook for 2 to 3 minutes, until the eggs are set. To serve, using a large spoon, carefully scoop from under each egg, gathering a bit of the sprout hash as you go. Season with salt and pepper to taste. I need to own this book. Eggs are my favorite food and this dish sounds amazing! Wonderful! So delicious and healthy. I am a big fan of Brussel sprouts. I love Brussel sprouts! This is so delicious and healthy as well. I eat a ton of eggs, as I have no cholesterol problem and find eggs an excellent source of protein - this hash is calling MY name big time! Looks delicious! This is definitely something I must try. It wouldn't think to make hash with Brussels sprout either! Your verdant photos have me longing to give it a try. Topped with eggs is a compelling dinner recipe! Egg yolk is pretty much my favorite savory meal topping...I could put it on ANYTHING. So I'm definitely into the concept of this cookbook! That hash is a beauty! Yes! 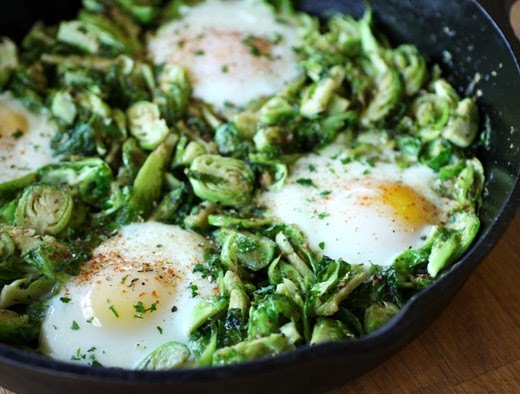 Eggs are such an incredible ingredient and I love to bake them on a bed of veggies, but I never thought to use brussels in hash or to finish the eggs on the stove top. So much inspiration today! Too bad I just scrambled up our last eggs for breakfast. Oh my, Lisa... What an amazing-looking skillet of goodness! I have made a "hash" with sprouts, but add proscuitto and gruyere to it. Am going to post it soon. The only negative I found is the cabbage scent is rather strong in the house. I feared I was starting to get tired of Brussels sprouts, but now I think I just need to try this recipe. It looks so great! I make hashed Brussels sprouts often which is more of a side dish. But I've never thought to make a Brussels sprouts hash! What a glorious idea! Thanks for this. It might sound weird to many but I love bitter foods and brussels sprout is no different. This version sounds very interesting since I have always had brussels sprout in curries. I'm intrigued! This is the Blond duck, by the way! anyway, wht ever it called, it must be tasty to the last spoon! Realmente una delicia lindo plato con bruselas me encantó,abrazos. This is such a cool idea Lisa. I have a big bag of brussells in my crisper at the moment. Perfect Saturday morning breakfast! Oh yeah, I have to check this book out, too. 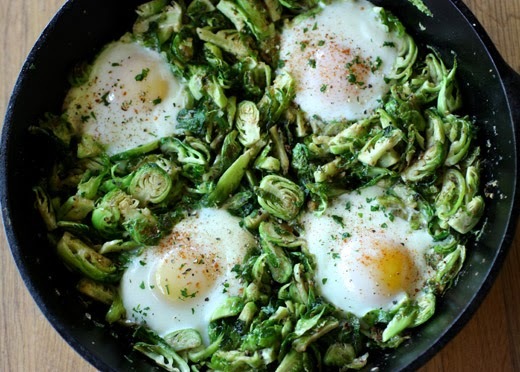 This dish looks amazing and I love the idea of brussel sprouts cooked this way. A really nice dinner. I LOVE Brussels sprouts! what a great idea!!! I want to make this.